Drip Fit® custom sweat bands are designed to enhance your results from using Drip Fit® during a workout. Our Drip Fit® works beneath the skin in creating increased heat. Our belt works to trap that heat in to amplify your sweat production in the midsection. Our sweat bands are made from the thinnest neoprene available to preserve heat, but not restrict movement, and are fully machine washable. My Velcro is super tough, how can I protect my band from ripping? When you first receive your waist belt, you may notice that the Velcro is stiff and hard to remove from the belt. This is normal! To maintain the longevity of your belt, DO NOT rip the Velcro from the band. Instead, please peel it back slowly. This will help to ensure your belt lasts longer and will help to preserve the neoprene on the inside of the belt. Will the Drip Fit waist band stain my clothes? Our bands are colour fastened, however, to fully avoid stains resulting from sweat or in the wash, we recommend washing it prior to first use. You can do this by running it through the washing machine several times (until it no longer bleeds) and hanging it to dry. What’s the quickest way to wash my band? After you’ve washed your band to ensure there is no bleed, the best way to clean your band is to rinse it off in the shower or sink, then hang to dry. Do you need a band to make the cream work? You do not need the band, however the neoprene locks in the heat that the cream creates which gives you amplified sweat results! For the best workout results use together. Amazing product can’t believe how much the drip fit band intensifies the heat from a work out….Amazing results already in only a week of use. I love how much a sweat using the cream and band. It’s really lightweight, comfortable, and seeing that waterfall of sweat at the end of my workout is so motivating! I bought my belt almost a year ago as well as the topical …let me tell you, WOW! The topical even makes you sweat without the waist belt! BUT with both products on, it’s like a INFRAREDsauna & you can actually feel your cells heating up internally as blood flow increases. I lost a lot of extra water weight my body was holding & haven’t put it back on even though I drink up to 2 gallons of water a day! Everytime I use the belt & take it off after my workout I am DRIPPING in sweat!! I love it (now that I’ve embraced it)! I can’t rave enough about these for myself & clients or friends!!! DON’T BE FOOLED BY CHEAP IMITATIONS – Most thigh sweat bands are cheaply made & fall apart within weeks while barely providing the support you need. With COMFORT + QUALITY make your exercise more productive by raising your hamstring & quad muscle temperature; making you sweat more, & increasing the number of calories you burn! This band is AMAZING! I love that it’s antibacterial so I don’t have to be concerned with washing it ALL the time (I do still wash it sometimes though) and love that it doesn’t move around while I’m working out or restrict me from any movement! I had a waist band previously that was okay, but not comfortable enough to wear for my workout (only cardio) so I was doubtful at first. 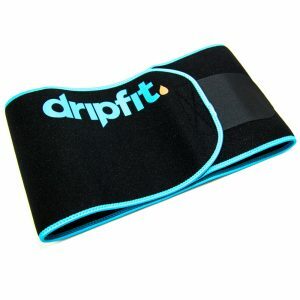 But I was AMAZED at how comfortable the DripFit band was (and how effective). I wear it every workout now. It’s super thin and flexible and there are NO scratchy edges. Honestly, it’s the BEST! Without the band, DripFit is good but with the band HOLY! DripFit is a whole new level. I wear mine during all types of workouts – weights, cardio, classes, spin, yoga – it never moves around and amplifies my sweat and results so much. It also helps to remind me to engage my core and keep my posture upright – score! Love how this heats me up during cardio! Had mine for 2 yr and still kicking ! I NEVER go a cardio session without my DripFit Creme and band. 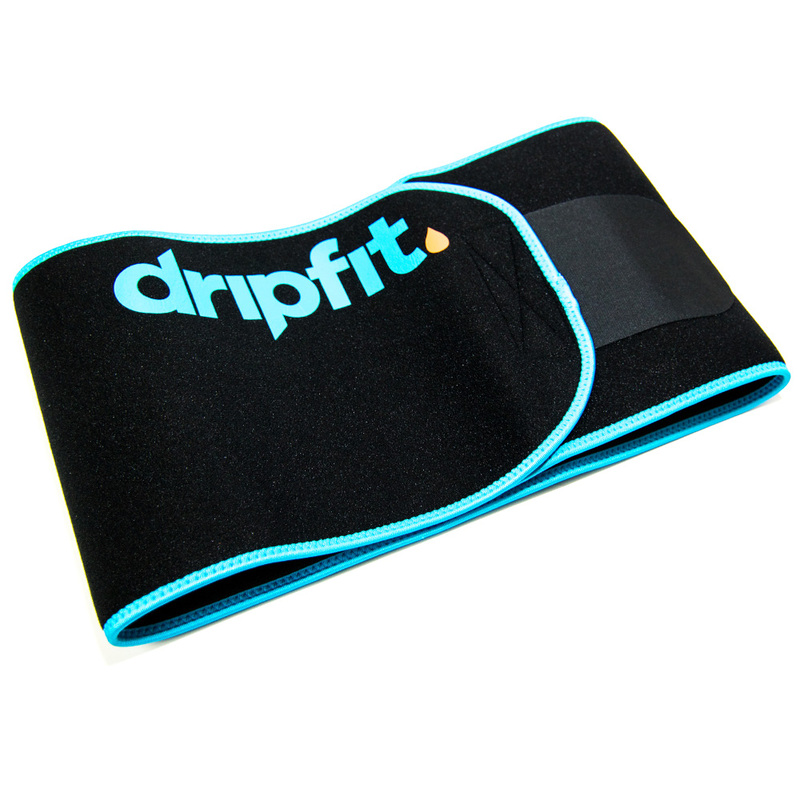 Although DripFit works without the band, it brings your sessions to a whole new level with it! Easy to wear under clothes, never gets in the way and there is no movement restrictions. My DripFit band has lasted me over a year now, very durable, and machine washable! I NEVER go a cardio session without my DripFit Creme and band. Although DripFit works without the band, having it on with the creme together brings your sessions to a whole new level with it! Easy to wear under clothes, never gets in the way and there is no movement restrictions. One of the most versatile belts I’ve ever owned!! Not only is it great for sweating in at the gym, hiking around or just being active! It’s machine washable !! Such a game changer! I first started out with the band i could see the sweat happening, the lightweight of the band is perfect doesnt feel like its in the way and targets the abdominal sweat which i needed and love. Pairing it with the creme makes it 1000% better 😍. Since using the band i also find i have a better posture and so easy to workout in. Extremely durable! I love how secure it feels when wearing it yet I’m still able to lift & do my cardio without restriction. Love this band SO much! It is a great fit, and is comfortable and light. Paired with the cream…a dynamic duo!!! Plus, the quality is great! This Band is a GAME-CHANGER when it comes to dripping sweat during a workout!! I fell in love with the DripFit Cream because of the incredible changes I felt in my body when using it and its 100% medicinal, natural ingredients….but when I added the band as well, it took my workouts to a whole other level!